Would you like to start a community garden near you? 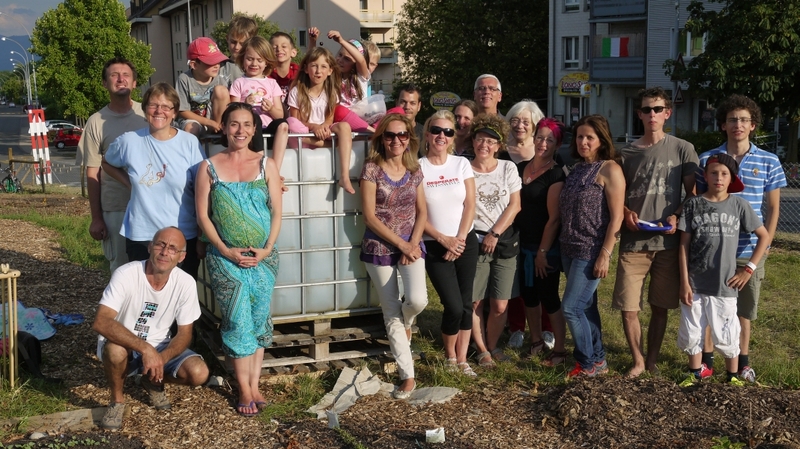 Here’s how we did it for our school and community garden, the Toutpousse by Lake Geneva, Switzerland and what we learned. Sunlight, at least 6 – 8 hours. You can garden in the shade, but it is more challenging. Find out the average hours of sunlight by looking at the shade cast on your plot at 9am, noon and 3pm ideally in the spring or autumn (when the sun is lower in the sky). This will give you an idea of which areas recieve enough light during the day. Water. The best source of water is the sky: connect to the downspout of neighboring buildings. Or try to use an existing tap. It can be very expensive to connect directly to mains water (>9000 CHF in our case for a pressure reducer housed in a separate structure!) You should find out if you need permission before using river water (and need to check it is clean). For rain water, identify the maximum length of drought periods. You will need a minimum of 10-20l/m2 of water per week. 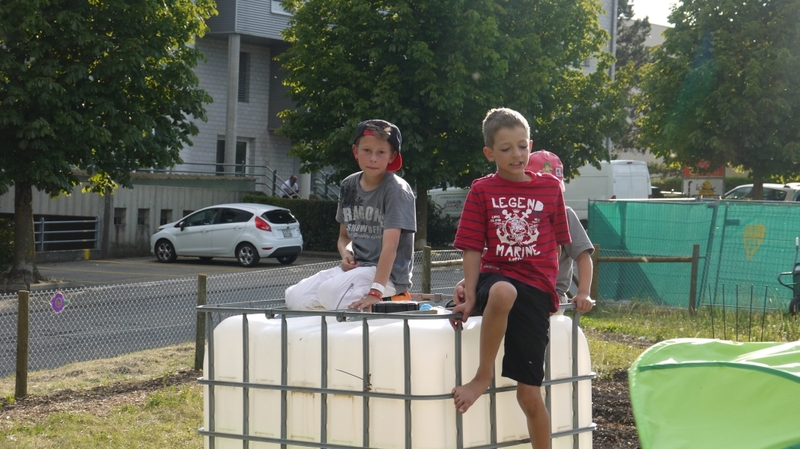 In our garden, the Toutpousse, with about 400m2 of cultivated space, we have decided to pay a neighbor to fill up our 4 IBC tanks of water about once a month. We happen to have a water meter, but we could simply pay his entire water bill, as it is not very expensive compared to the price of a meter. Soil. You can of course garden in containers if you are on tarmac or polluted soil. You will need to ensure regular watering in that case. Anyway, you should do everything you can to make sure your soil as biologically active as possible! Our canton of Vaud as an on-line cartography office, geo.vd.ch. A similar service might help you find out the owner of the land you have identified. Be aware that agricultural land might have restrictions on use or construction. Your town council should be able to help you with this information. You can start the project with a handful of people, but I recommend including a maximum number of people as early as possible. The more people and groups of society are involved, the more support your project will get and the higher it’s social impact will be. Talk to everyone about it! 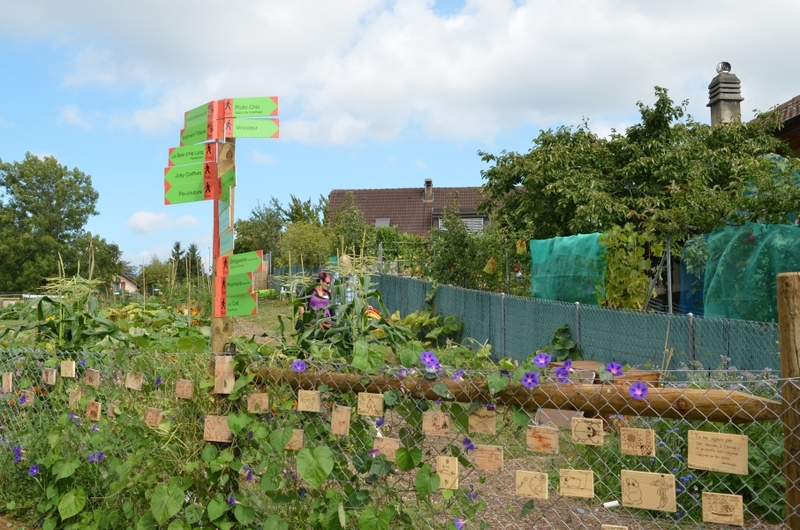 What could your community garden do for them – whether they’re involved of not? Somebody who’s not interested for themselves might point you to somebody who is. For the Toutpousse, the primary school’s interest was the swaying argument for the owner to lend us the land. You might even find subsidies for the project as it will impact the participants health, as well as improve social cohesion of the neighborhood. How to get everyone together? We met the main pillars of the community garden at an information evening we organized initially. We invited the public to this meeting by putting up posters. Our friends at écojardins de Morges put flyers through letterboxes. You could imagine a cool event or action on the site itself. Don’t underestimate word of mouth (especially by people with a good network) and medias such as local papers, facebook, town council, school, churches, etc. This comes at a price, you could easily spend 1000 CHF for communication. We were sponsored by a local printer (Appi) for the posters and a designer for a logo (arobas). Think about the costs currently incurred by the owner for the maintenance of the land: a pasture or lawn needs to be mown at least twice a year, which is not free. Are there any financial advantages to lend you the terrain? If not, would you be able to rent it? For how much? We concluded a « prêt à l’usage » with the electrical society that owns the plot. This contract gives the details of the conditions of the loan, the rights and responsibilities of each partner and outlines how/when the contract ends. You will not be able to do this without money. In our case the biggest expense was a new fence, without which we would not be allowed to have school classes work in the garden. It was the sponsoring of the local shops, now signposted at the garden entrance, that helped us master this hurdle. The protestant church took up a collection to pay for a tool shed. Generous gifts by soroptimistes Nyon and IMI hydronic engineering financed the sign at the entrance and a tarp with our logo. Individual people received wooden plaques to draw their own design on in exchange for a fixed contribution. These plaques can still be seen on the fence as a proof of the wide support our project has in the community. All in all, the initial cost of our garden was less than 4.000 CHF, which came in little by little. We did not receive any subsidies. This allowed us to advance very quickly, but restrained our budget! Please use the comment section to share resources you have found in your quest for a community garden! Cette entrée a été publiée dans English, Mauverney. Bookmarquez ce permalien. ← Le BRF, vous connaissez?